If you work in a dental office, whether as a dentist, oral surgeon, or hygienist, it's important to understand the various cranial nerves that could be affected by dental treatments, surgeries, and procedures. Damage to the nerves in the oral cavity could result in serious health implications for your patients. And problems with these nerves can mimic dental conditions, which can lead to misdiagnoses. In fact, 33.6% of trigeminal neuralgia patients have been misdiagnosed with dental problems by a dentist. Given the placement of these nerves and their proximity to dental work, it's important for your practice to carry dental malpractice insurance. Here's what you need to know. Check it out below. There are 12 cranial nerves. The nerve that is most commonly affected by dental work is the 5th cranial nerve, which is also called the trigeminal nerve. It is called the trigeminal nerve because it has three branches, one of which is located in the oral cavity and is called the mandibular nerve. The mandibular nerve also has branches which includes the inferior alveolar nerve and the mylohyoid nerve. The inferior alveolar nerve is the nerve that provides sensation in the gums and teeth. The mylohyoid nerve provides motor function to the mylohyoid muscle and the digastric muscle. The mylohyoid muscle is located in the floor of the oral cavity, underneath the tongue. The digastric muscle is a small muscle underneath the jaw. Given the location of the mandibular nerve branch of the trigeminal nerve, which is in the oral cavity, any damage to this nerve can be problematic for the patient. A damaged nerve can cause your patient to experience strange tastes and sensations, severe pain, and/or facial paralysis. Any of these symptoms can cause a patient to have difficulty continuing their lives as they were before the nerve was damaged. One of the most severe problems associated with damage to a branch in the 5th cranial nerve is called trigeminal neuralgia. This condition has been referred to as the suicide disease by many in the medical community. People with this condition often find themselves suffering with pain for the rest of their lives as there is no cure. However, there are a few treatments available to alleviate the pain, including microvascular decompression of the 5th cranial nerve, which is an intensive brain surgery. It's important to note that the branches of the 5th cranial nerve can be damaged in ways other than through dental work. Sometimes, heredity plays a role as well, but the patient may not feel any symptoms until later in life. Therefore, screening your patients prior to dental work is important, especially before deep anesthetic injections, oral surgery, root canal treatments, dental implant placement, and wisdom teeth removal. 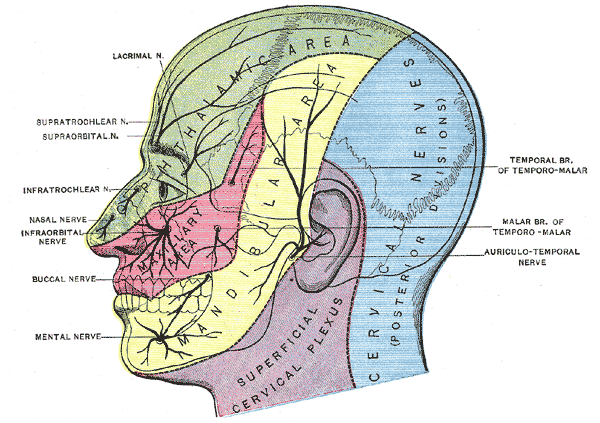 To test for the sensation of the branches of the trigeminal nerve, lightly touch the patient's face in the three regions that can be affected by damage to the nerve, which are the mandibular, maxillary, and ophthalmic area. If the patient experiences pain or flinches to the touch, refer the patient to a neurosurgeon before you do any dental work on them. The reason for this is to protect yourself from a dental malpractice lawsuit in case the patient is already affected by an undiagnosed trigeminal neuralgia. For the motor part of the nerve network, you'll need to test the muscle groups that are involved, which are the mylohyoid and digastric muscles. These muscle groups help control chewing, swallowing, and speaking. To determine if these muscles are functioning properly, ask your patient to move their tongue to the roof of their mouth and to both sides. The tongue should move fluidly without any problem. If there is cause for concern, refer the patient to a neurologist before continuing with dental treatment.